The Optomap® Retinal Exam is used in our optometry practices in Montgomery Mall, North Wales, PA and Roosevelt Mall in Northeast Philadelphia, PA to get a comprehensive view of the retina (back of the eye). We believe this is the best way to evaluate the health of the inside of your eye. This instrument allows us to detect possible abnormalities or signs of disease, and can provide early diagnosis and treatment. Retinal imaging using Optomap® is an important tool for the screening and diagnosis of eye conditions, such as retinal detachment and age-related macular degeneration, and can also indicate evidence of non-eye diseases, such as diabetes, hypertension and certain cancers. In most instances Optomap® can be used in place of dilating your eyes which allows you to avoid the side effects of dilating drops, which are blurry vision and sensitivity to light for several hours. Your doctor will determine which is the best way to determine your retinal health as your eye exam proceeds. Please schedule your optomap® Retinal Exam today! Come to our Roosevelt Mall Philadelphia clinic for the OPTOS retinal exam. 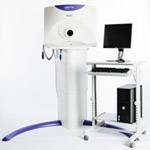 Our eye doctors offer the Optomap retinal eye exam in Philadelphia, PA.